Congratulations to Billie Eilish, who scores a record-breaking Number 1 on this week's Official Albums Chart with WHEN WE ALL FALL ASLEEP, WHERE DO WE GO?. The US singer-songwriter's debut album lands straight in at the top with 48,000 combined sales. 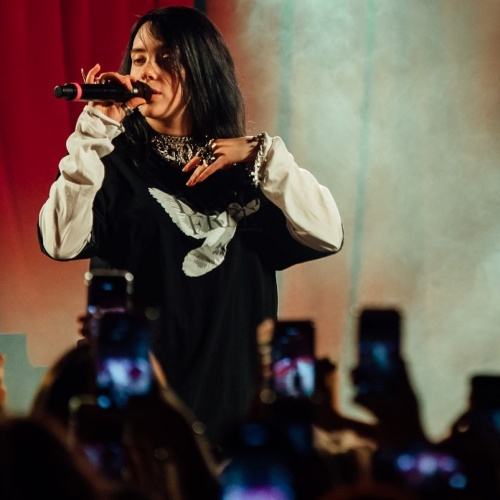 At 17 years old, Billie becomes the youngest female artist in UK chart history to score a Number 1 album. "I appreciate you making WHEN WE ALL FALL ASLEEP, WHERE DO WE GO? the #1 album in the UK so much. We worked really hard on this album. Thank you for the love!!" At 17 years, 3 months and 18 days old, Billie overtakes Joss Stone as the youngest female to top the Official Albums Chart. Joss' 2004 record Mind, Body & Soul reached Number 1 when she was 17 years, 5 months and 28 days old. Meanwhile, The Greatest Showman rebounds from 3 to 2, Tom Walker's What A Time To Be Alive lifts from 4 to 3, and Queen's Bohemian Rhapsody hops a place to 5 for a 15th non-consecutive week in the Top 5. Further down, Scottish singer-songwriter Gerry Cinnamon zooms 52 places to Number 20 with Erratic Cinematic, making his Top 40 debut following a sold-out UK tour. Heavy metal artist Devin Townsend enters at Number 23 album with Empath, and Pink's Greatest Hits... So Far! returns to the Top 40 at Number 29 in the build up to her forthcoming album Hurts 2B Human. Search & buy Billie Eilish tickets below.